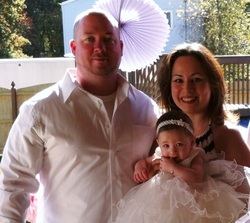 Vanessa's parents wanted a traditional baptism in the name of Jesus Christ for their daughter. They also loved the beautiful water blessing in the Baby Blessing ceremony, so we combined the two. You have been invited here as family and friends and your prayers and spiritual support in Vanessa’s life have been requested. It has been said that in a Christening, Heaven comes down and surrounds the child with God's love for which the effect is lifelong. We join our thoughts and sincere goodwill, asking that Christ's peace might embrace this family and an arc of God's light surround Vanessa for all of her days. Our Lord and Savior Jesus Christ instructs us that all should come to faith with the eyes and heart of a child. Today, we dedicate Vanessa to Our God in this Christening. In Jesus Christ, we are set free of the punishment of sin and oppression of law. By grace in faith we are forgiven and assured eternal life. Matthew and Ileana will you teach Vanessa the truth that from this moment she may realize her unity with God and of Christian doctrine, the gospel ministry and of the salvation by grace through our Lord and Savior Jesus Christ? Will you try to conduct your own life so that by both word and example, Vanessa may learn to live joyously and harmoniously with Christian principle and the assurance of salvation - will you strive to do this to the best of your ability? _____and _____, as Godparents to Vanessa, God will give you the wisdom and ability to hold within your heart forever her spiritual welfare. You are charged with the responsibility of seeing to the spiritual welfare of this child should the need arise and it is you who stands as spiritual counselors. Do you promise to love, honor, support and encourage Vanessa throughout her life? So be it. We christen you Vanessa the name of the Father, the Son and the Holy Spirit. Amen. I christen you that you may know the pure and holy spirit of God, your eternal source of faith. May you come to know God within your heart all the days of your life and express your highest potential in Christian service. I baptize you Vanessa _____l in the name of the Father; In the name of the Son; and in the name of the Holy Spirit; Amen. We pray for the care and protection of Vanessa in body and soul. We surrender her to your hands. Please, Dear Heavenly Father, bind your angels to bless and attend her always. May her heart grow strong, may she love patiently, and may she do what is good and holy in your eyes. This we pray in the name of our Lord and Savior Jesus Christ. Amen. Vanessa, as a child of the covenant, receive this blessing. In Baptism you are sealed by the Holy Spirit and marked as Christ's own forever and ever. Amen. Throughout the Bible, Old and New Testament, anointing with oil was an act in recognition of wealth, prominence, inheritance and position. Yet in the anointing of Christ before her death on the cross, we were shown the true measure of possession, inheritance and wealth is not found by worldly measures. Vanessa, having now been dedicated into the Kingdom of God, Your family and I will now anoint thee with all the wealth you now possess as one in the Kingdom of God - the power and majesty of our Lord God; the unlimited and sacrificial love of our Lord and Savior Jesus Christ, and the spiritual wisdom and assurance of the Holy Spirit; and of your great inheritance - life everlasting in the paradise of heaven - of perfect peace, harmony and joy. No man or woman could possess more than this. Officiant will anoint Child’s forehead In the name of the Father; of the Son; and the Holy Spirit; Amen. Then the Mother will anoint Child in the name of the Father, of the Son; and the Holy Spirit. Then father, will anoint Child in the name of the Father, of the Son; and the Holy Spirit. Vanessa, from this day onward, no matter how dark the world may seem nor how alone and lost you may feel, you shall never be alone again, never without hope or assurance of final victory. Friends and family may God’s blessings rest upon you, may his peace abide with you, and may his presence illuminate your hearts now and forever more. Go in peace.